I'm so excited to say I'm now a Just Born Ambassador, which means I'll be sharing items with you on their behalf on occasion... regardless, all opinions expressed below are my own. The countdown is on... We have less than 3 weeks until our little darling arrives and that's if she comes on her due date, can I just say I'm beyond excited?! I've been in a constant nesting mode for the last couple days and I have a feeling it's not easing up any time soon. I've washed her clothes and blankets a few times now, cleaned her toys, organized her books by color, and reorganized how everything is set up in her nursery a few times. Tonight I even took the time to officially pack everything into our hospital bag. With so many cute items in her closet, I'm not going to lie, it was difficult to narrow down which items of her wardrobe need to come along. While I'm still debating on a few outfits, there was one specific item I knew had to be packed in her bag the moment I laid my eyes upon it, it's perfect - just like her! 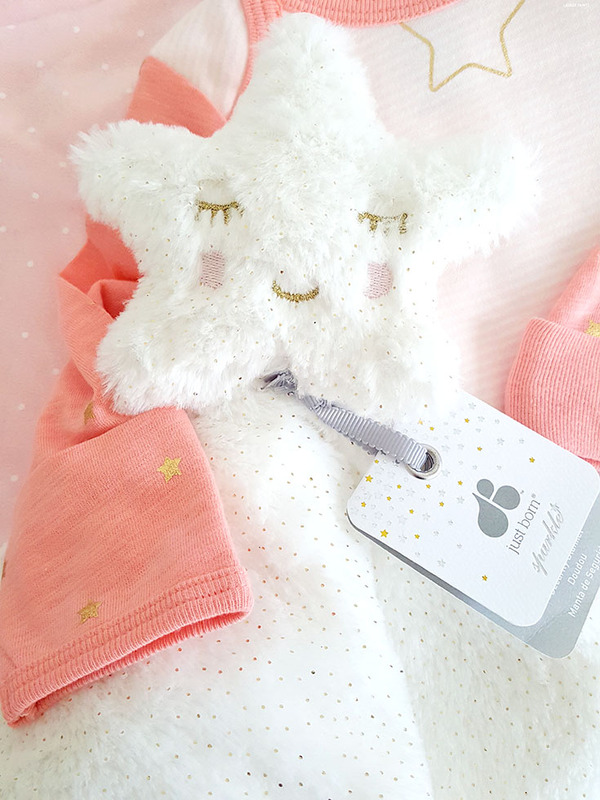 Our Just Born Sparkle Gown is too adorable not to include in her bag, with dainty little stars and the most feminine shade of coral pink... I fell in love with it the second I saw it and I can't wait to see her in it! Paired with the adorable little hat to keep her warm, I'm certain everyone will be gaga over her adorableness in this get up! 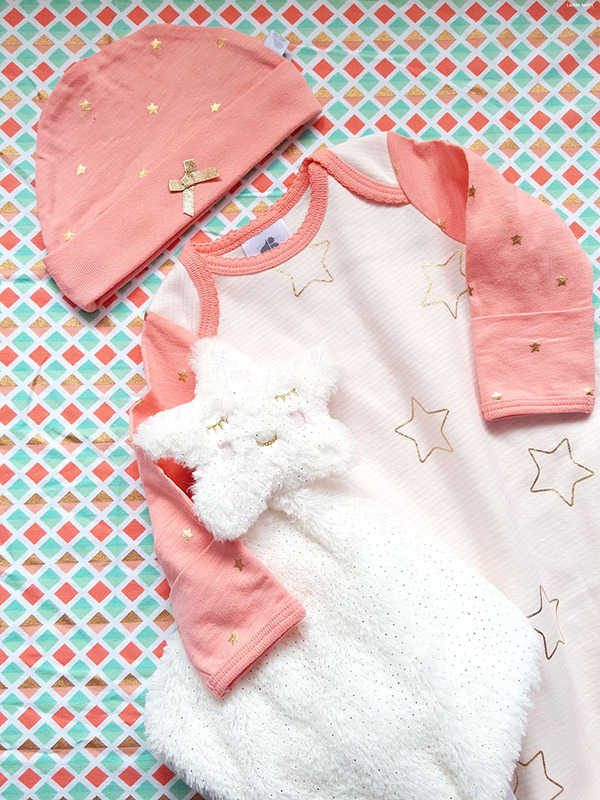 The tiny, sparkly gold details, the beautiful shade of coral, and the super soft fabric are just so perfect! Not only is the little layette gown adorable, it's super soft so I don't have to worry about her being uncomfortable... It's the perfect match to the little sparkly lovey I plan on bringing for her as well. 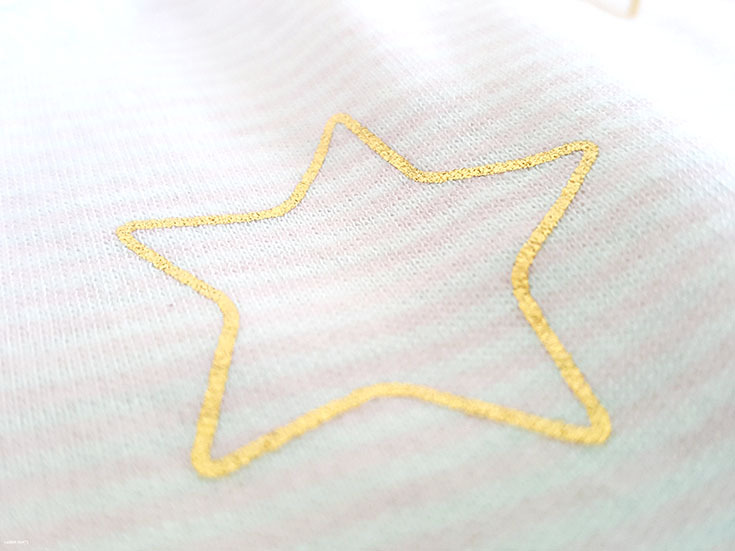 The little star lovey from Just Born is so incredibly soft and sparkly, it's just perfect for my little darling. 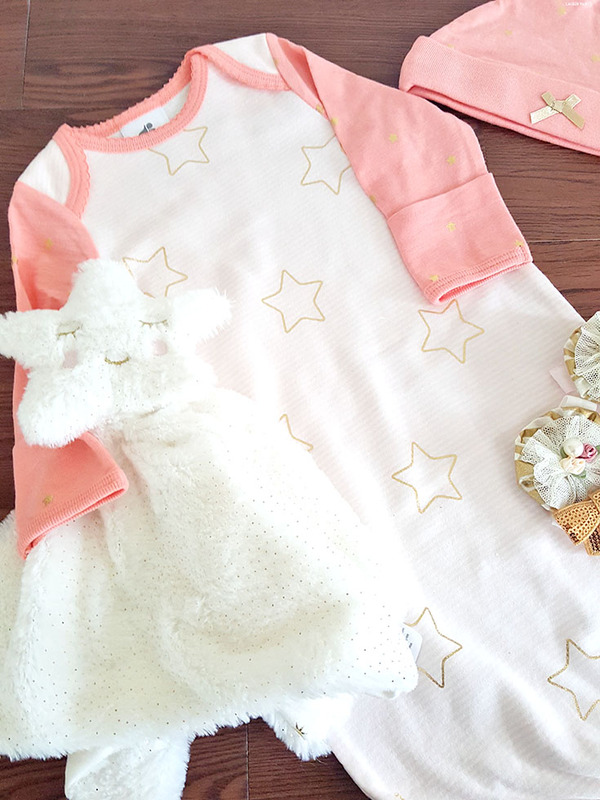 Honestly, I may have a case of "2nd baby fever" already thinking about how adorable her little newborn pictures will be with her Just Born Sparkle goodies! It's a little crazy how much I love her already - she's our shining star, our little love, and I can't wait to treat her as such. 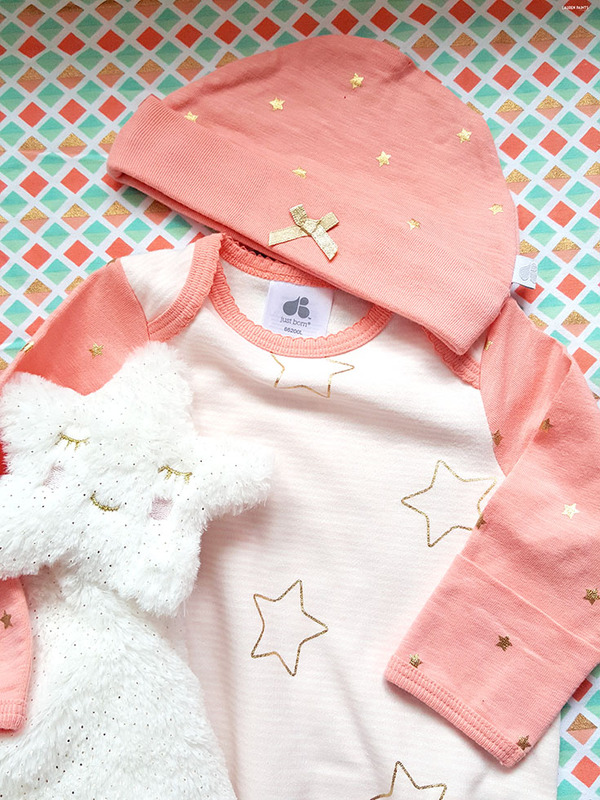 If you or a friend are expecting, I highly suggest you check out the NEW Just Born Sparkle line at Buy, Buy, Baby... you'll fall in love with the glitz and want the whole line, I promise!